Winners Compare Their Achievements With Their Goals..
Education is a better safeguard of liberty than a standing army..
To Encourage The Sense Of Leadership And Duty..
'The Renaissance Academy', Tilhar is a co-educational English Medium school, offering classes from Pre-Nursery to 12th affiliated to CBSE, New Delhi. We foster academic excellence in a progressive school environment, which is safe and caring. Every minute of the child spent in the school has a bearing on his personality and character. No effort is being spared in making children, who would not only strengthen the fabric of democratic society but galvanize the whole process of development and take the country to newer heights. 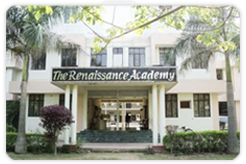 With ever challenging educational scenario and social expectations, ‘The Renaissance Academy’ fosters academic excellence in a progressive school environment empowering the students intellectually, physically, socially and emotionally with value oriented life skills to prepare them as self confident leaders of tomorrow.